Aargh, rain. Well that’s put an end to my Plein-air painting plan. I’m only glad that my studio has an entire wall of north-facing window, it’s really murky out there. No blogs next week as I’m on a portrait workshop. Actually, if you can bear it, and my technology doesn’t fail, I could post a day-by-day update. 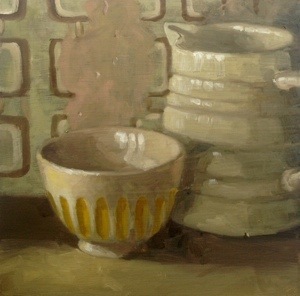 This little bowl made it’s way to the front of my cupboard so I felt obliged to listen to it and put it in a painting. Yesterday was a great day. Some painting in the morning and then walking in the bright Northamptonshire sunshine with friends after lunch at my favourite pub, the Plough at Everdon. Should you ever be in want of some fabulous scenery to walk in and a delicious home cooked lunch in a cosy country pub, it’s the place to be but ssshhh… Don’t tell everyone! To top that, in The Furrow (a lovely bric-a-brac) shop in the pub garden, I found an excellent prop for paintings, an old petrol can with chipped paint. The sort of thing hat makes my heart sing. THEN, if that we’re not enough, I arrived home to find, on my doorstep a package containing the most delicious homemade jam and marmalade sent by one of my lovely readers, how thoughtful was that! I am always knocked sideways by extraordinary acts if kindness that come out of the blue – thank you Annie! After that, another delicious meal cooked by a friend I hadn’t seen in too long. What a great day indeed. If this continues, they will have to roll me onto that plane next week. Here are some snowdrops which were a belated Christmas present requested in November. It had to wait for the arrival of spring. Just in case you’re sick of snowdrops, here are some onions I did before leaving Pakistan. The sun is shining and I’m off for a pub lunch and a walk with some pals…fab. Back to the snowdrops tomorrow! Aaah…snowdrops. Yes, I’m back in the UK and spent last Friday happily pulling up snowdrops from the garden and painting them, despite the rain pounding on the studio roof threatening destruction if not death. Wow, whatever has happened to England? When the sun finally came out on Sunday I had a great day clearing out and cleaning the studio, something I don’t do often but it’s very cathartic. Now half-term is upon us and many family commitments are keeping me out of my beloved studio. Will do my utmost to fend them off. I’m looking forward to getting back to my garden studio this week (if it’s not underwater) and some inspiring fruits, vegetables and flowers, imported or not. In the meantime, here’s a larger painting of the ubiquitous eggshells. Right, off to find my flippers.